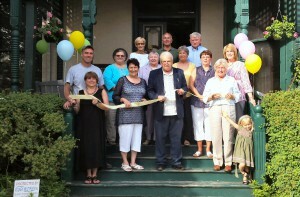 The Pratt House grand reopening ribbon cutting. From left, bottom row: Sue Lane, Paula Rohn, Mayor Ronald Woodward, Sarah Conley, little Lilly Holsopple. Middle row: Ralph Waldron, Carol Dexter, Elma Smith, Jean Lewis, Cindy Bickford, Sue Brown. Top Row: Sue Ebert, John Finocchiaro and Fred Sumner. 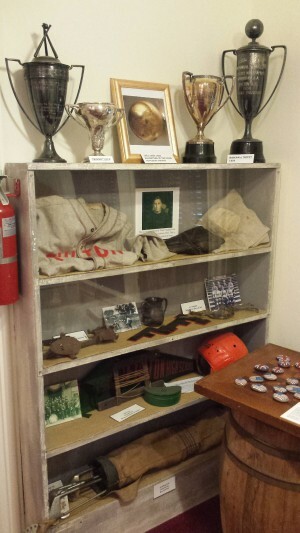 FULTON, NY – Fulton’s rich history is alive and well … living in the John Wells Pratt House. Built in 1861 by John Wells Pratt, the historic Pratt House has been restored and cared for by Fulton’s own Friends of History for roughly 35 years. Listed on the National and NYS Register of Historic Sites, the house serves as an educational service focusing on Fulton’s history throughout the house. “Although we might not be considered a rich city now, Fulton has a very rich history. We need to appreciate that, it needs to be remembered,” said Pratt House Manager/Executive Secretary, Sue Lane. John Wells Pratt, a Fulton man who worked on the ships at the canal since age 10, along with his wife, Harriet and their four children, built and occupied the house. Some member of the Pratt family had lived in the house from the time it was built until 1975. At that time, the last Pratt woman to occupy the house, Helen Hayes Pratt, found it to be too big for just herself. She then decided to put the house on the market and move across town to the Hayes Farm, another historic piece of Fulton. The LC Smith room on the second level of the Pratt House shows tribute to the business that once prospered in Fulton, manufacturing guns, bicycles and fans. The house was on the market for a couple years, until Burger King bought the house with intent to demolish it for property space. After Burger King demolished a carriage house and a couple outbuildings, they set their sights on the Pratt House. This is when then-mayor Percy Patrick along with the other city fathers thought that it was not a good idea to tear down all of the historic homes on South First Street. For this reason, the city purchased the home back. From this time, Friends of History was born and the Pratt House Museum was in its infancy. The one room in the house that is set to period, is the kitchen. The kitchen has the original work table and original stove from the house’s very beginning in 1861. However, these are not the only original pieces of the house. While there are many original fixtures that were built in to the house still intact, the group was actually able to regain an original piece of furniture. “When the house was sold, all of the contents were auctioned off. A woman purchased the dining room suite and a few years ago decided she no longer needed it. She reached out to us and asked if we would be interested in re-purchasing the original dining room table set. So, now that is back in its rightful place as well,” said Lane. Nestles tribute area on the second floor of the Fulton Pratt House. The upstairs of the house boasts of Fulton history. There are antique tributes to Hunter Arms/LC Smith, Nestles, Foster Knife Company, American Woolen Mills, Heart Pottery Company and many others. All of these businesses were once thriving in the heavily industrious city of Fulton. “American Woolen Mills was a huge company in Fulton employing roughly 2,400 people. That’s a large company by today’s standards, so in the 1800s that was considered huge. LC Smith was a gun manufacturer that was also a large business in Fulton in its day. We do a homecoming weekend in August around this business. We have displays set up, people bring their own guns and we showcase ours, then we shoot them off and have a celebratory dinner. Gun people know they are one of the finest guns ever made, we get people from all over come in for that event,” said Lane. The members of the Friends of History hope to show everyone the successful, prideful history of the city of Fulton. 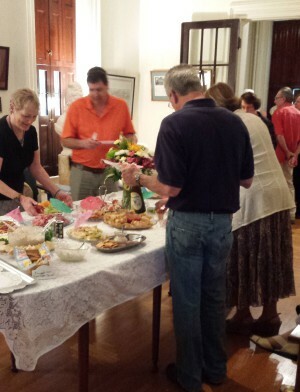 Community members enjoy food, drinks and fun at the Pratt House reopening. “We like that everyone is able to leave with a better understanding of how prosperous and industrious Fulton was. Not many people know this, but The Depression actually missed Fulton. The city was unaffected because we were so rich in industry. In 1950, things had begun to change. We didn’t use the water ways anymore and we lost the business of LC Smith and American Woolen Mills. That was the start of the decline of industry in Fulton. No matter where we stand now, Fulton has a rich history and that’s something we should be proud of. We have to keep it alive,” said Lane. The Pratt House helps spread its educational services throughout the year through a number of events and fundraisers. The house and its members start the spring season with a chicken barbeque. They then continue on to their annual Porch Party, this year being called the Grand Reopening Celebration. 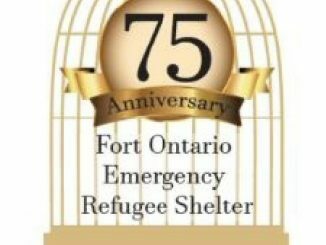 Throughout the year there are a series of other events including another chicken barbeque, a yard sale, and educational programs at different locations throughout town. Every event the Pratt House holds is able to tie back to historical education. Each chicken barbeque is held at Bullhead Point which the women of the house find historically significant, calling it “the Coney Island of New York” when Recreation Park used to have a Ferris wheel and a boardwalk around the lake. Their four educational programs throughout the year take place at local businesses with historical context in Fulton. 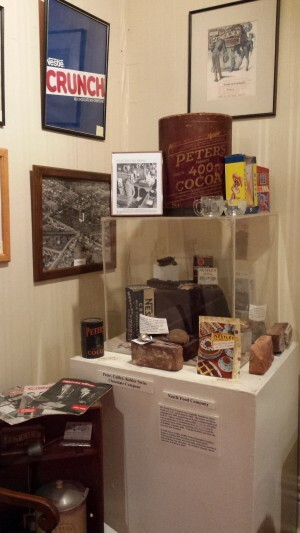 Last year, they presented at Hargraves Pharmacy and were able to display the history of the store and present a speaker, George Demass, a representative of Oswego’s Safe Haven of Fort Ontario; it was the only site in America for refugees fleeing the Holocaust in World War II. This year, the group is excited to present a ghost walk in both the Fulton Public Library and the Pratt House in the fall. Ghost hunters surveyed the house from dusk until nearly dawn and resulted in the detection of entities at both the Pratt House and the library. These ghost hunters will return in the fall to host the ghost walk. The house members say they can “neither confirm nor deny” whether there is a presence or the house is haunted. They do feel as though some strange things have happened in the house. “If there is a spirit here, they’re very friendly,” said Lane. The Pratt House has also started a scholarship for G. Ray Bodley students to apply for. The scholarship is for $300 and usually has something to do with community involvement and the students love of history. The house ends the season before closing for winter with the annual Parade of Trees event. Each year, schools, non-profits and businesses are able to decorate a Christmas tree to be displayed throughout the house. This bookshelf showcases antique sporting equipment used in Fulton throughout history. The Pratt House is open Monday through Friday for two weeks while people are able to view the trees submitted in the parade. The community and the students involved are then able to vote for the favorite tree. Last year, the house had 18 trees spread about through the first floor; they are hoping for even more this year. First, second and third place winners for schools and non-profits win a monetary prize, while businesses win a certificate of appreciation. “They get very creative, they really use their imagination,” said Pratt House Vice President, Sarah Conley. “Everyone is given a tour of the house during Parade of Trees and the event serves as a great way to get young students and the public aware of the Pratt House and its importance in Fulton history,” Lane explained. Fourth grade curriculum covers local history. So, many schools use the Pratt House as a field trip destination for their students. “A lot of the children, the students that come here are in awe. Especially of the dining room table for some reason. I think they are just not used to it, the whole concept; eating at the table, fine dining dishware. I think that was a rude awakening for us on how disconnected the young people are but if we can get them in here, they always leave entranced,” said Lane. Getting the youth involved has proven to be one of the hardest parts of maintaining the house, according to the Pratt House women. “To the younger people, 20th Century antiques and information is old to them, this stuff is older still. A lot of youth ask ‘What do you mean (phones) had cords?’ or ‘What is a telephone operator?’ etc. Younger people are interested in antiques, just they mostly know of only newer antiques,” said Lane. The Pratt House hopes to gain more memberships from younger people and families. Members receive invitations to every function as well as a newsletter that goes out four times a year telling what is going on at the Pratt House including parties, speakers, events, and some facts on Victorian era. “Little by little we are getting the word out,” said Lane. 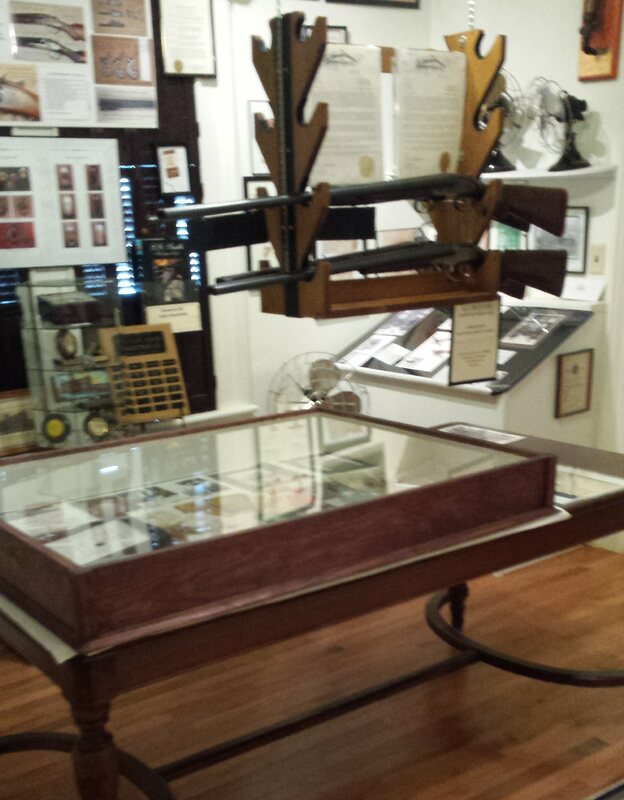 The Pratt House is able to help keep the history of the house and Fulton city alive through its members and donations. “Everything we accomplish at this house is done through donations, but it is certainly not spent frivolously. We keep this house in operating condition by the generous donations of our members and supporters,” said Lane. Being 150 years old combined with a rough winter, the house saw some water damage from a boiler malfunction that needed to be fixed before being able to reopen this year. Ralph Waldron Construction worked throughout the winter to restore the house to its former beauty in time for the grand reopening held on June 5. The Pratt House held its reopening with a ribbon cutting with the mayor of Fulton, plentiful amounts of food and refreshments, music, cake and tours available for everyone in attendance. Lane added that they received a couple new memberships, including those from Waldron construction workers and their families. “This has been great. It’s truly incredible when our members and supporters come through like this,” said Pratt House President, Paula Rohn. For anyone interested in visiting the Pratt House or inquiring about a membership, the house is open Wednesday through Friday from 10 a.m. to 3 p.m. at 177 S. First St.